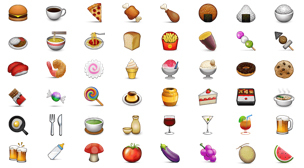 In America and in "the West," the texting world is enamored with emoji. Emoji 絵文字（えもじ） literally means picture (絵) letters (文字). These are little drawings that go along with your text and they look like this. That is not what this guide is about. Although emoji are still a thing in Japan, there is a totally different text-related art form that is much more advanced. It is called kaomoji 顔文字（かおもじ）, which literally means face (顔) letters (文字). This is all done with actual text characters. Things you can type, pulled from hundreds of different languages. In the West, we actually have kaomoji too. 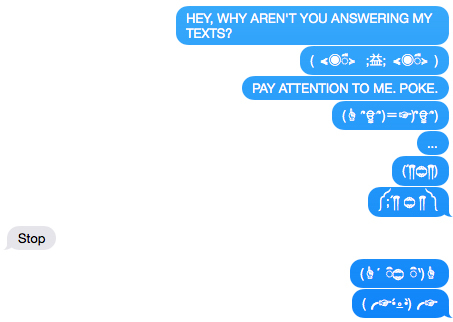 We call them "emoticons" and they're about as advanced as caveman etchings. But, you've probably seen and used these sad excuses for creative expression used outside of Asia and Japan. Riveting. Is there a kaomoji for "We are terrible at kaomoji?" (There probably is). 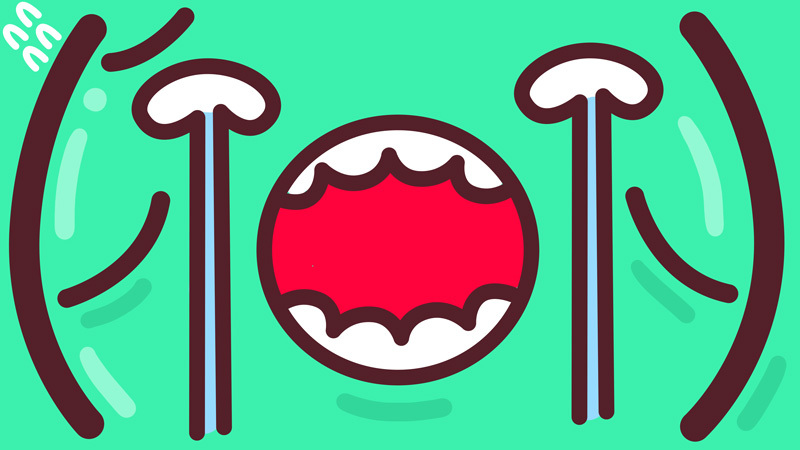 With Western emoticons, the focus is placed more on the mouth. Is it happy? Is it really happy? Is it sad? Is it sticking its tongue out at you? If I learned anything from America's Next Top Model it's that emotion should be in your eyes. Smeyes! In Japan and much of Asia, this is exactly what emoticons do. There's much more focus here, though I'd say everything else has much more focus as well. 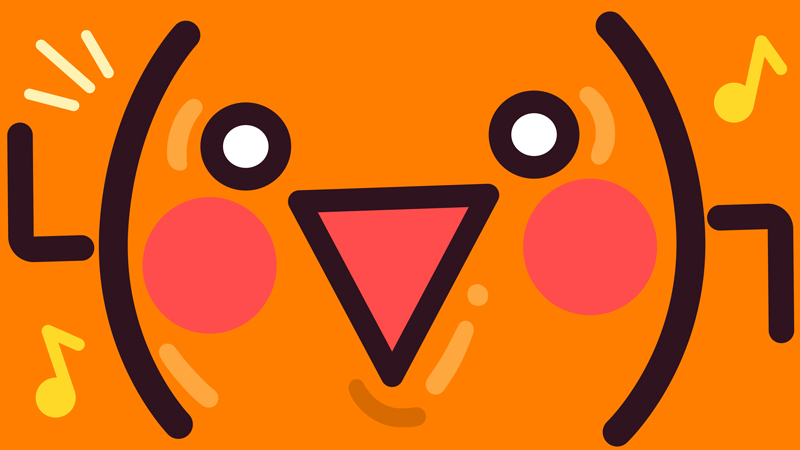 This is possible thanks to one big difference: Japanese emoticons are right-side-up and not sideways. By doing this you can create some pretty intricate faces. The best way to understand kaomoji is to break them up into categories. The most basic categories all involve emotion, so it's a good place to start. This is just the tip of the iceberg, though. Basic emotions are just that: basic. But, they're going to come up a lot so you'll find them very useful. 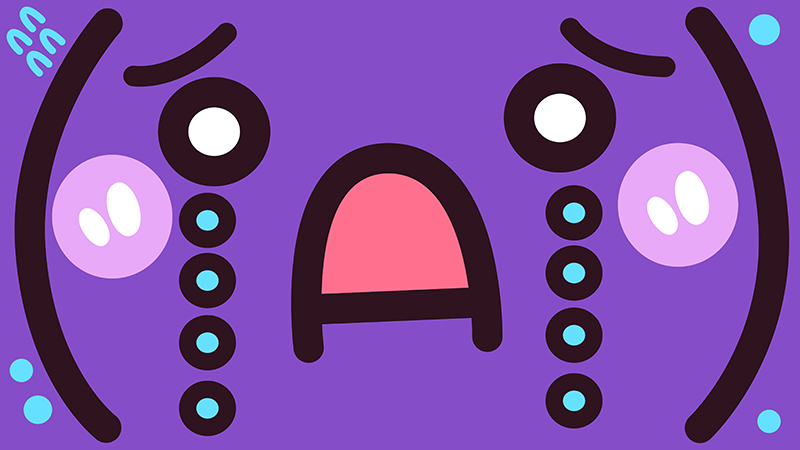 Here are some emotion-related kaomoji, curated by yours truly. For each category there are probably thousands more kaomoji (with angry ones being the best by far). There are also many more emotions that I didn't cover. You'll learn how to find the exact kaomoji you want later in this guide, but for now let's not overwhelm you. Let's move on to another important topic. In Japan, aisatsu (greetings), are a very important part of the culture. That importance is projected onto the kaomoji as well. There are a ton that only have to do with greeting someone. Instead of just saying a boring old "ohayougozaimasu" (good morning) you can now spice it up with kaomoji. There's even some flower action going on down there. There are a lot of kaomoji that represent different kinds of movements as well. Try to do that, sideways Western emoticons! Other "movement" categories exist, but there aren't many in each one. Some slightly more populated examples include: "looking," "praying," and even "throwing away." There are plenty of useful kaomoji that don't fall into the main categories. These are those. One other cool one, which I couldn't fit in my tables: Letterhead / Mail. Put it in your email signatures to be one of the cool kids. I gave you a lot of kaomoji to choose from up above. Just copy and paste as the appropriate situation presents itself (or keep reading to learn much easier typing shortcuts). What if the above symbol-pictures don't emote what you want, though? How can you find what you're looking for? There are others, too. If you search for 顔文字 or even just "kaomoji" you're bound to find more than you can safely handle. Because kaomoji are such a Japanese thing, most of the (good) websites are going to be in Japanese. You don't need to be able to read Japanese to find the kaomoji you're looking for, but it certainly does help. Here's a step-by-step guide on how to find the special japanese-picture-typins that you're looking for. What do you want to find? 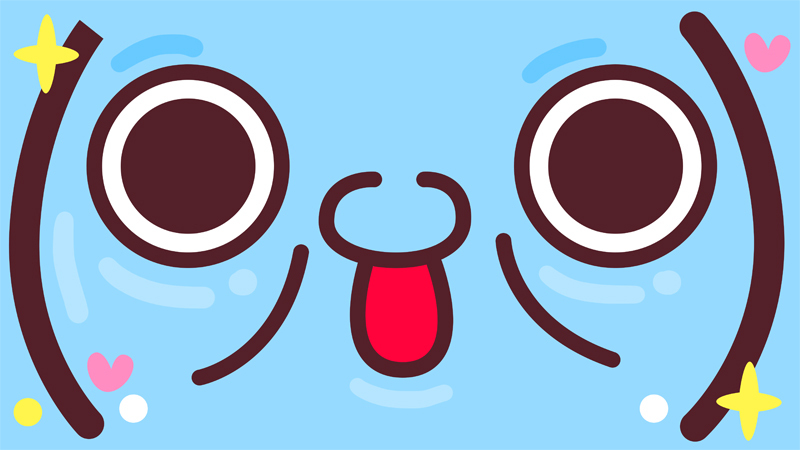 Think about the kaomoji you want to find. "Gross kaomoji?" "Cat kaomoji?" You're only limited by your imagination. Put it into an online dictionary to find the Japanese word Take the word before "kaomoji" and put it in an online dictionary. Jisho is good. Slap "顔文字" onto the end of it (with a space) Find the word for it and put it before 顔文字, with a space. For example, if I search for "gross" I might come up with きもい in a Japanese dictionary. So, I'd put that before 顔文字 and get "きもい 顔文字." Search In Google, "きもい 顔文字" gets some good results. Trust me, one can never have too many きもい 顔文字 at their disposal. I also searched for neko 猫（ねこ） (cat kaomoji). And, because I love it I went back to weird ones again. Okay, fine, so most of these could just go into the きもい category, but I wanted a third example and more weird kaomoji on here, so now everybody wins. As you can see, results were pretty good! Some things will get you way more results, others less, but I think most of you will find what you're looking for. If your Japanese isn't at a very high level (or doesn't exist), make sure you try synonyms of the words you search for. The top result in a dictionary isn't always the best result. If you want even more kaomoji in your life, look no further than Twitter. There are a bunch of accounts that just tweet your favorite Japanese style of 'moji'. With this, you can get your daily dose of kaomoji and find new kaomoji that you like trickled to you a little at a time. 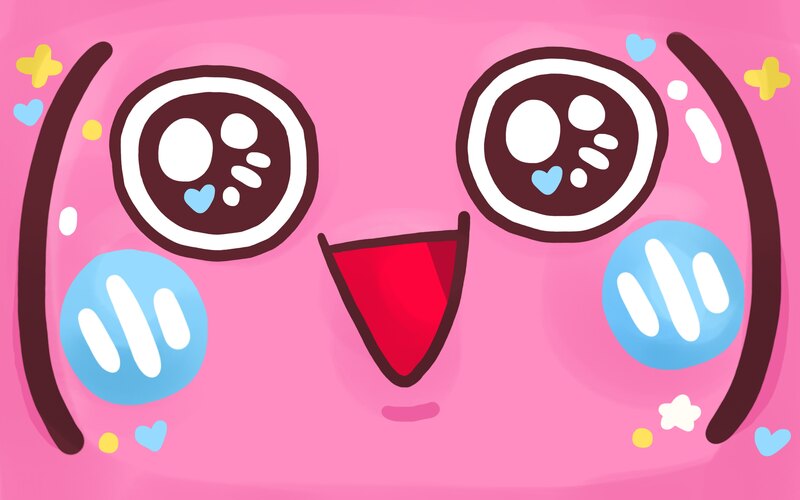 When you look at how intricate kaomoji can get, making your own may seem out of reach. But, everyone has to start somewhere, and that somewhere is by being a copycat. Starting with these simple pieces, you can simply go through the list of existing kaomoji and grab the parts you like. For example, I like ۝ as a mouth. I like ≼●≽ eyes. Then you put those together, add a body, put some hands on it, and maybe add some text or other "motion" characters and you have this masterpiece: One dude getting angry at another dude. I just made my very own! That was easier than I expected. If you have a specific emotion or category in mind, you'll probably have the best luck in the correct categories of existing kaomoji. But, you never know. Go collect your favorite pieces and create your own beautiful pieces of 'moji art. 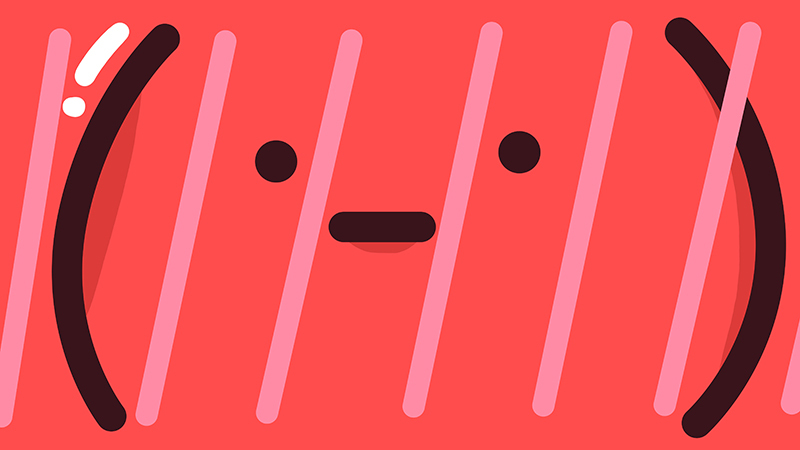 If you have to copy and paste, kaomoji can feel like more trouble than it's worth. When you're chatting or needing to type quickly, there's no time for that. Plus, the faster a you produce your face-picture-made-of-symbols, the more impressive and impactful it feels for the recipient. There are a few ways to make writing kaomoji just as easy as typing regular words. 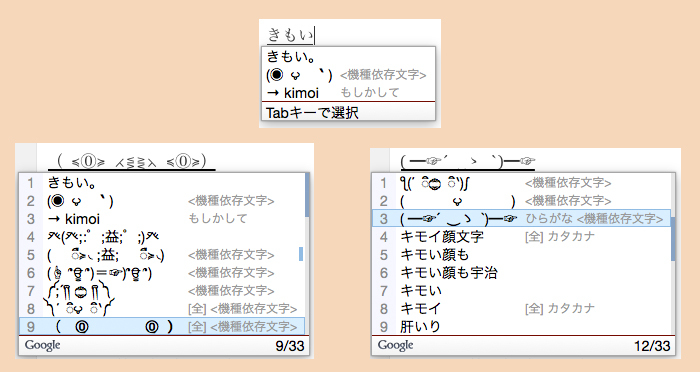 The most common way to type in kaomoji is by adding it to your IME's dictionary. An IME is a bit of software that lets you type in Japanese (and other languages) using your native keyboard. My personal favorite for Japanese is Google's Japanese IME. You can use that on Windows or OSX, or you can use the IME built into your operating system. 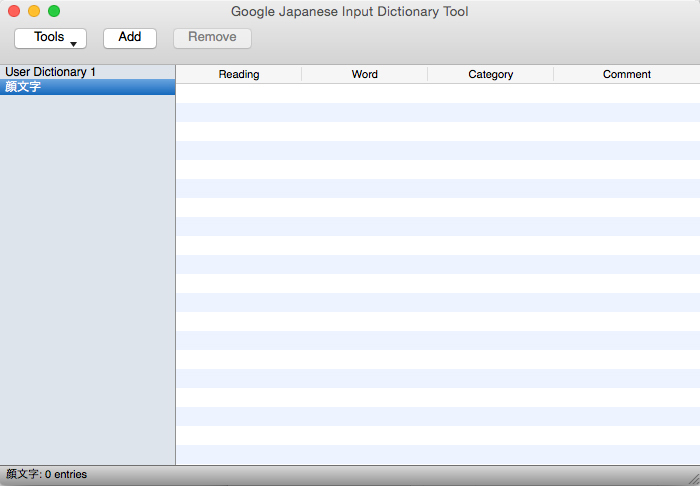 For Google's Japanese IME there is an application called "Dictionary Tool." When you open that up, it will give you the ability to be able to create your own custom "dictionary." The original use for this was so that you could add your own words. You put the reading of the word in the reading slot (for example: うれしい). Then, you put the word in kanji (or whatever) in the word slot (for example: HAPPY!). Now when I type in うれしい, "HAPPY!" will pop up as an option. I think you know where I'm heading with this. I created a dictionary called kaomoji 顔文字（）. Now I can add my favorites to my personal dictionary. For example, let's give きもい a bunch of new words. Some of the characters don't actually show up, which I think is an issue with Google's IME, but when I output them they turn out fine. In terms of this example, I would have to type "きもい" in my IME. When I do that, I see the standard options for the word as well as the items I added in the dictionary tool. You can use any "reading" you want though. I know a lot of people just use the reading kaomoji かおもじ（） and have one big list. The IME will learn your preferences too. Kaomoji you use a lot will show up much higher on your list. Those you don't use that often will move to the bottom. But, they'll all be within reach. If you become an avid kaomoji user, though, it's best to make it easier to find exactly the one you're looking for. I am including the dictionary I created to make using 1,103 kaomoji easier. You can get it here(Kaomoji Dictionary. It's dictionary and a pdf kaomoji list inside the zip file. Double click the かおもじ dictionary and close the resulting window. Open the book in Koteri preferences input menu > Koteri Preferences > [Dictionary] tab open かおもじ book. Now when you type certain japanese words in hiragana and you hit space some faces will show up. 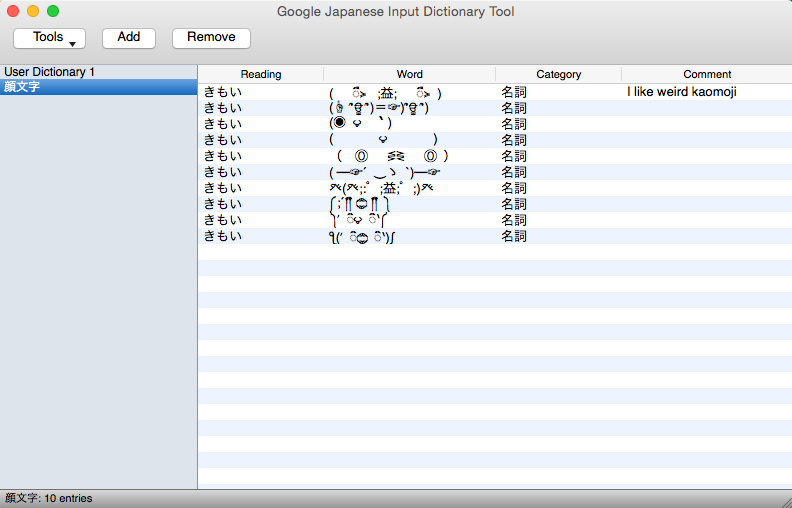 With the dictionary I included the list of 1,103 kaomoji with what you type first and the output second. To use it type the characters in the first column (using hiragana) and hit space, the faces will be in the transliteration menu that pops up. Just in case that disappears, you can also download the dictionary file here. That one will only work on Koteri IME on OSX, though. I wasn't able to add it to Google IME, though perhaps I wasn't being creative enough about it. 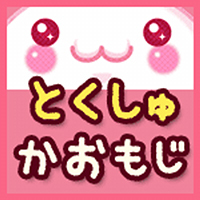 Also, here's another webpage that lists different places to get a kaomoji dictionary file. There are apps out there that are known as "text expander tools." They run in the background, waiting for you to type out the correct combination of keys and then BAM! Something is pooped out instead of that combination of characters. You get the picture. 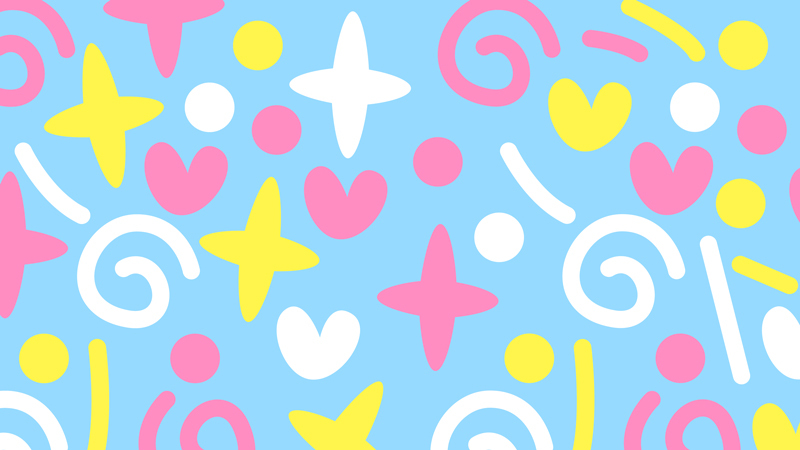 My "pattern" for kaomoji always starts with //k (because I'll probably never type that sequence of keys in normally) plus the emotion / action that I want. Here's what a portion of my personal list looks like. This way, if I want to send someone a sarcastic clapping kaomoji, it's only 7 characters away from happening. I don't have to find it, copy it, and then paste it. I just type in "//kclap" and it's done. 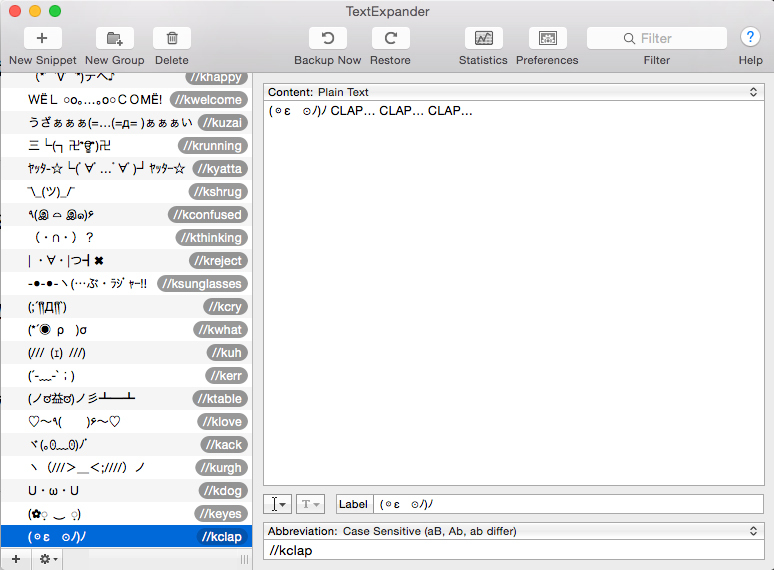 For OSX, my favorite text expanding app is TextExpander by Smile Software. Of course, I use it for non-kaomoji things as well and it has saved me a lot of time. Apparently I have used it to expand 18,768 snippets saving me 663,931 characters and 27.66 hours in the last 1.5 months. Maybe that will help you to justify the purchase. Buying it only for kaomoji is totally understandable (and honorable), but it does have its other uses too. Another app that can do text expansion on OSX is Alfred. They recently added snippet support. I haven't actually tried any of these apps for Windows, but the word on the street is that Breevy is the best option out there, though somewhat pricey. PhraseExpress and Lifehacker's Texter app are also supposed to be good options. On mobile, I know that iOS and Android both have keyboards that you can install that will support kaomoji. 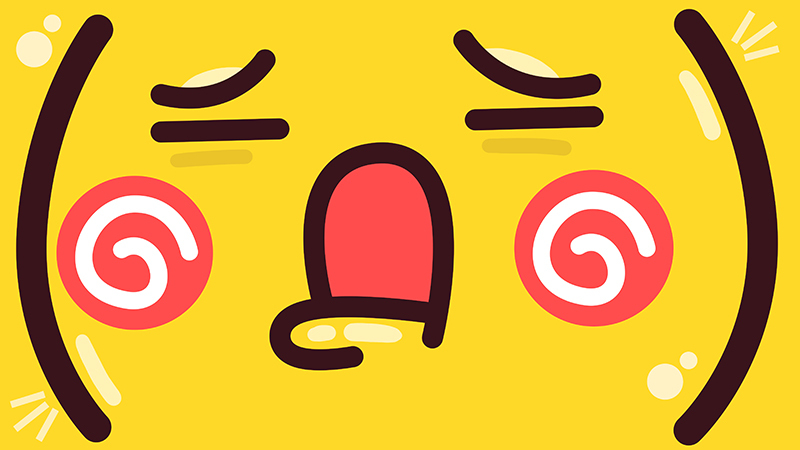 You'll want to do a search for "kaomoji" or "顔文字" on your respective app store. I personally use Simeji on iOS (they have an Android version too), but that's mostly because there are plenty of super weird ones on there. There's a "face" button that you press and up comes a whole bunch of kaomoji. You can even sort by emotion, and it remembers the ones you've used recently. I don't think I use more than 10 different ones on that app, so all the weird faces are there ready for my use. If you've read this far, you probably want to use kaomoji. Start simple, otherwise it gets overwhelming. You'll find your favorite ten (or so) that you use a lot. Once you get comfortable with that you can branch out. Like anything, if you use these too much on your friends, they'll get annoyed. Good. They'll appreciate your hard work someday. 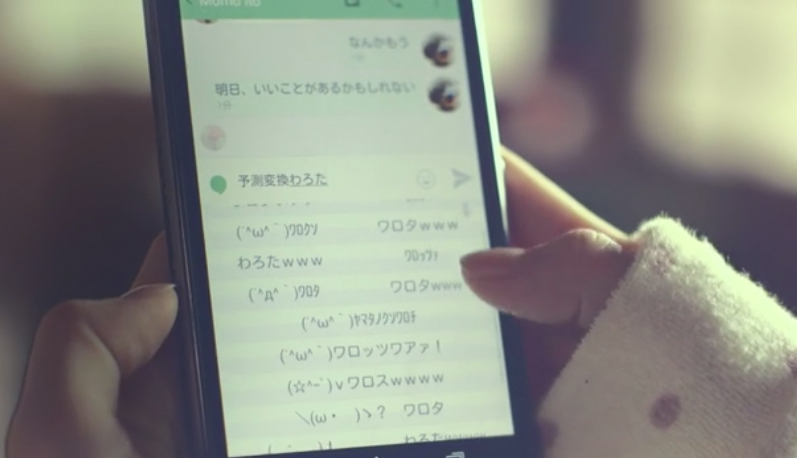 In all seriousness, though, kaomoji does make text and communication much more interesting. The amount of emotion that you can put into some of these is nothing short of miraculous. I know I'd enjoy emails a little more if you people would use kaomoji more often (hint hint). Hope you enjoyed this guide. Now go out there, young padawan. People are waiting to be entertained.